Twas the night before Valentine's Day and all through the house....no one cared. Wait, except they did. Two of my kids wanted to give their friends cards and gifts at the last minute. So we raced to Kroger to see what Valentine's Day cards were left. It turned out, not much. I refused to spend more than $4 on anything. I rolled my eyes at over priced hearts filled with chocolate. I made fun of people that "made a big deal about Valentine's Day" out loud. "What has happened to me?," I asked Lucy who was with me. "When did I become such a Valentine's Day Scrooge? Don't I believe in love?" It's the first time in over a decade that I haven't decorated the house or made cutesy hearts for the big day. Can I blame this on post-election/inaugural fatigue and depression? Is Trump to blame for my lack of Valentine's Day excitement? Maybe. But it could also be a busy life and older kids that aren't that into my cutesy hearts. Maybe it's just a slump. Maybe it's because it's on a Tuesday. Maybe it's because I'm tired. Whatever it is, I'm just not that into it. I was waiting for that moment when I get out of my slump. That moment when I throw open the shutters and tell everyone I love them and throw out a nickel for someone to go buy a goose, i.e. Scrooge's morning after the spririts' visit. Or the moment my heart grows three sizes, I mean if I were a Valentine's Day Grinch (which I think I am!). Then it happened. It might not have been as dramatic as buying a goose, but I did remember how much I love love and how lucky I feel and how there's so many things to smile about. And how even after all these years of talking about not getting caught up in expectations and what things are supposed to look like, I did; and how Valentine's Day can be every day, and love is love is love and ahhhhhh. The spirit of Valentine's Day hit me when I was playing DJ at the first grade party and I was dancing with a bunch of sweet kiddos not caring how silly we looked. Once again dancing and silliness for the win. It ALWAYS reminds me that there is goodness in the world. 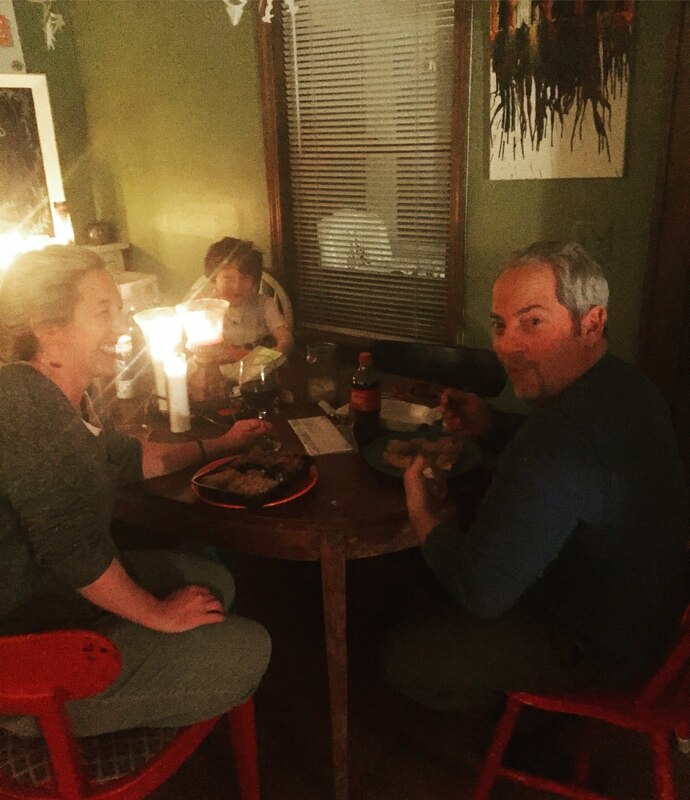 Later that night, Tim and I tried to have a romantic candlelight dinner in the middle of our chaotic family, and it was kind of hilarious and perfect. Especially when Wade joined us and talked our ears off about his day. I'm not the worst or a Valentine's Day Scrooge because I was grumpy at Kroger (I mean who isn't grumpy at Kroger sometimes right? )or because it was the first time in a decade that I didn't decorate the house with paper hearts and make heart shaped-brownies like a "good mom." I was the worst for forgetting that love looks different all the time and it's in all the small and big moments in my family. 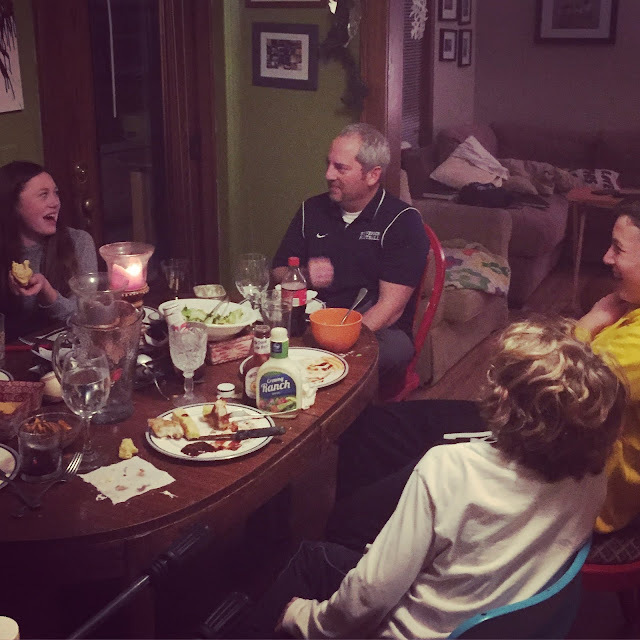 Love is a family dinner ritual with candles and conversation and laughs. Monday night seems to be the night lately that everyone is home and we can eat together, so I jumped on it and I look forward to Monday nights all weekend long. Love is embracing a different kind of romance. Having older kids means we don't have to hire a babysitter. 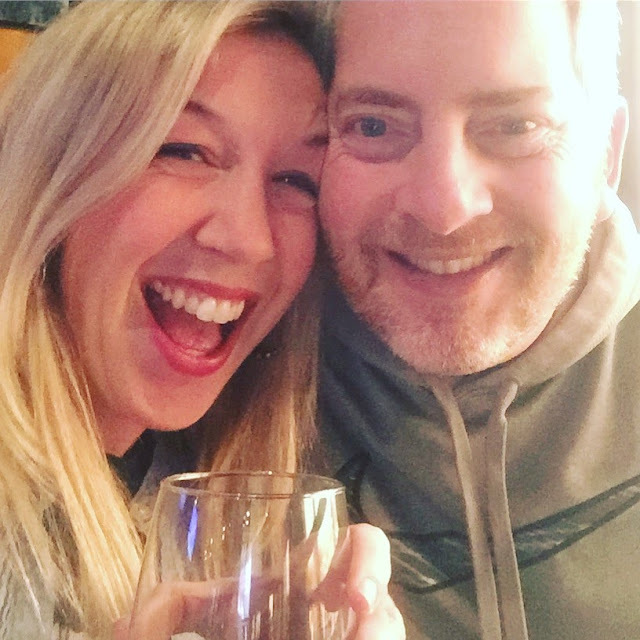 We took advantage of this and snuck out to a happy hour last Friday night where I had three cheap glasses of wine! Annnnnd then went home and watched a movie with the little boys and went to bed before 10 p.m. Boosh! Love is being happy about the simple things. Like PJ day at Preschool. One of the 5,764 things I love about working in a preschool is wearing my pajamas to work. The best! Perfect Valentine's Day PJ shirt. Love is falling in love with your husband all over again because he is an incredible father. He's the kind of father in TV shows and movies that you think couldn't possibly be real because who is that kind and good? Tim is. The other day we were talking about how Wade is having trouble being the youngest of four busy kids, some who are being pretty teenager-y lately. Tim said, "He needs the tractors at Home Depot." Tim and I took Wade to sit on the tractors, and they pretended they were spaceships. Tim knew he needed time to be a little kid. And my heart exploded with love. 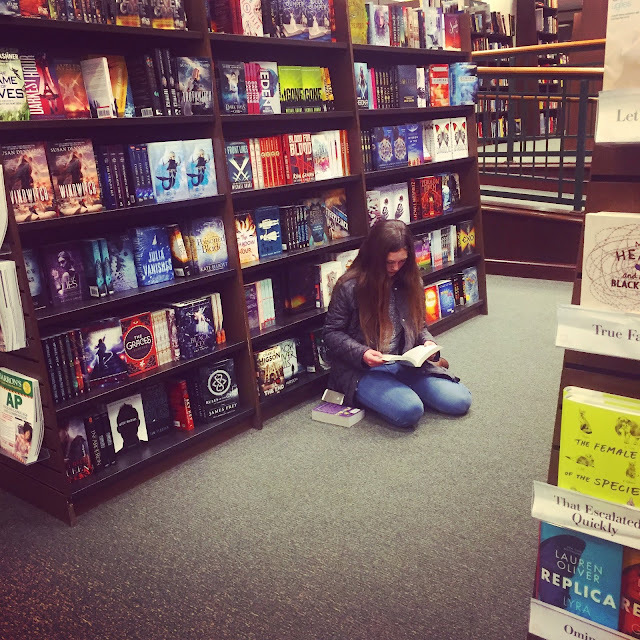 Love is watching your kids do what they love and become even more interesting people. Lucy in her happy place--a book store!!!!! Ahhhhh!!!!!!! JT and sports = his true love. And I love that mural in the small town gym. Love is art and hope! Gulp, love is letting go and letting your kids grow up. Holy woah, Peyton got his driver's permit. Love is taking a minute and remembering what you love about your kids and telling them. 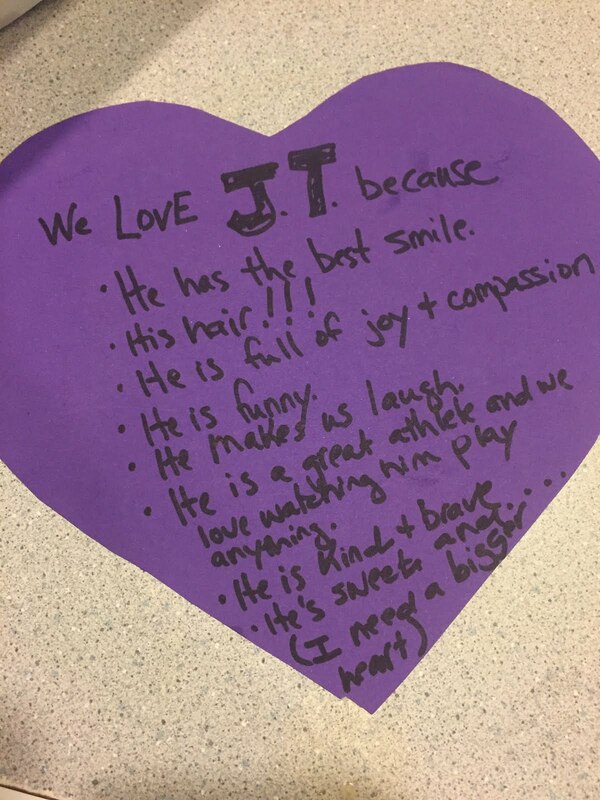 Filling out this heart was a "homework assignment" for parents sent by JT's teacher. And just like I did when I was in school, I forgot about it until the morning it was due. Lol. I turned it in on time and enjoyed thinking about all the things I love about JT and letting him know. I'm not the worst or a Valentine's Day Scrooge because I was grumpy at Kroger (I mean who isn't grumpy at Kroger sometimes right? )or because it was the first time in a decade that I didn't decorate the house with paper hearts and make heart shaped-brownies like a "good mom." I might be the worst because I forgot how lucky I am and how love is everywhere. Right now when things seem so wonky in the world, remembering the simple but huge moments I love feels good. This "Hallmark holiday" helped remind me of all the love. So geez, Valentine's Day, I think I love you!